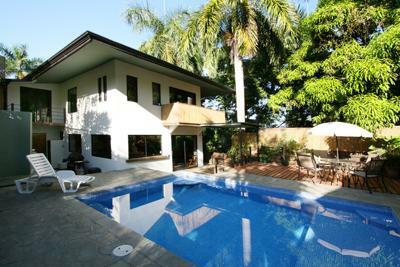 Located in the heart of Manuel Antonio, in a quiet residential area. This 2,000 ft2, 4 bedroom, 2.5 bath house was completed in 2008 and offers a comfortable, tropical experience in Costa Rica's most popular destination. House has easy access with covered parking; just 4 minutes walk from the main road between Manuel Antonio and Quepos. The house is within easy walking distance of a bus stop, plus several restaurants and hotels. The house has an open-air floor plan downstairs with a spacious kitchen, dinning room, and living area with a stunning terrace with jungle views running the whole length of the house. The bright kitchen is fully equipped with new appliances. The comfortable living area has two sofas plus large screen TV with cable and DVD. The dining area comfortably seats six. There is one bedroom situated off the living area, which can be used as a great guest bedroom or office, plus a convenient half bath. Upstairs are 3 further bedrooms. There are 2 large master bedrooms with a large terrace running the full length of the house. Both master bedrooms are finished with spacious wooden closets; the en-suite bathrooms are in natural stone with unique frosted glass windows with jungle scenes. There is one further bedroom with a private balcony. The house has a great pool and out side living area, plus outdoor grill. White faced, and squirrel monkeys visit the area regularly, as well as sloths, iguanas and exotic birds. This home offers the best value for a 4-bedroom rental home in the area. Enjoy a cool, clean, comfortable, contemporary space while not breaking your budget. Only $2000 per month plus bills. Long term rentals only (6 - 12 months+). Call 8979-4120 for more details. All things considered, you have clarified nature of instruction in a manner that general individuals come to know its significance. The issue in todays' reality is that understudies don't have information which field to pick. The best arrangement of this is to visit our custom writing service and direct a short meeting online with local essayists who will control you in hitter way. is the house available now for long term rental?